The Hostgator web hosting plans are one of six different offerings, including VPS, Cloud, Builder, WordPress, and Dedicated servers. Also known as shared hosting, it provides you with space on a server to host your website. This is shared with other accounts – hence the name “shared”. In this overview, I’ll show you the different types of Hostgator web hosting plans, the basic features of each, and their limitations. You can also visit my page to choose the Hostgator coupon code that gives you the highest discounts. This will give you 1 year free when you sign up for three years – effectively a discount of 66%. That’s the highest discount you’re going to get from Hostgator over such a long billing cycle! What About Hostgator Free Hosting? Keep in mind that after 1 month, you’ll be charged the full amount for hosting – so it’s actually a pretty bad deal if you want something long term! Each plan also comes with a 45-day money back guarantee, so there’s no harm in trying it out before you commit. Do I Get a Free Hostgator Domain with Web Hosting? 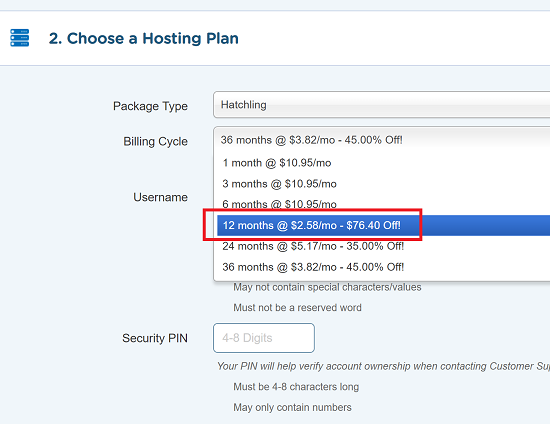 No, Hostgator web hosting doesn’t include a free domain. If you want one, you can opt for the Hostgator website builder package instead that has a free domain included! This is the starter Hostgator web hosting plan. It includes all the features explained above. The only real limitation is that you can only sign up for a single domain. This means that if you have more than one website – say personal and business – you can’t host them both on the same plan. I actually recommend this over GoDaddy’s $1/m hosting because of the free SSL. For more information, you can read my complete review of the Hostgator Hatchling plan. The Baby plan is the upgraded version of Hatchling. They’re functionally exactly the same. There are only two differences. First, you can have as many domains as you want. This makes it ideal of “parking” domains – meaning if you have a collection of domains you want to keep or sell, this is a great plan for showing them off for advertising purposes. With the Hatchling plan, you can’t do this. The second difference is that you can purchase a dedicated IP address for an additional $4 a month. Here’s a full review of the Hostgator Baby plan. Finally, the Business plan is the high-end of Hostgator web hosting. It comes with three perks. Here’s a complete review of the Hostgator Business plan. As for other restrictions, Hostgator will suspend any account that uses 25% of the server’s resources for more than 90 seconds. You can see from Hostgator’s Terms of Service, that they have the right to terminate your account for any violation. Unlike SiteGround’s limitations for example, Hostgator’s limits are much vaguer. Other than “25% of server resources”, there’s not much to go by. No specific limit on script executions, CPU seconds, or anything concrete that you can monitor. This might be deliberate if they don’t want anyone gaming the system. Instead of “example.com”, use your domain name. The 2083 URLs allow you to log in securely via HTTPS and SSL, whereas the 2082 ports are insecure. To login to the Hostgator email that’s included with every account, use one of the following, replacing “yourdomain.com” with the name of the actual domain. You can login to specific webmail clients as well, using the following URLs. One thing to remember is that you need to login to these sites with the username and password combination for your specific email inbox. It’s not your cPanel login! Keep in mind however, that good customer support isn’t cheap. While Hostgator’s customer service is quite good, there are other web hosts with better customer service! The Hostgator web hosting plans are quite comprehensive. They give you everything you would want in a Linux-based environment. If you host just one site, the Hatchling plan is your best bet. If you want more than one site, or need to park some domains, then the Baby plan is better. If you need the positive SSL for increased business trust and security, then the Business plan is right for you!